All three of these books came out on the heels of each other. Two, as most readers familiar with the subject area know, are books that analyze the anti-vaccine movement and how it poses a danger to society. The third book, published by Skyhorse Publishing who also published Wakefield and Stagliano's books, has a very different take on vaccines and view vaccines as the danger. What struck me as these books arrived, was how very similar they were in packaging: bold capitalized black titles on a bright white background with red print to make a fiery counterpoint to the starkness of the black an white. It's not just the message, you know: it's the packaging. And that concept: that it's the packaging that matters most, can't be missed with any of these works. All three books have significant portions of text dedicated to footnotes to substantiate the claims made in the works. Of the three, Mnookin's prose is the most pleasing, and the easiest to read.Offit is the most credentialed author: this is his field of expertise, and portions of it are familiar reading for those who have traversed this ground with Offit in his other works. One writer, Orac, criticized Offit for not placing Wakefield more front and center in Deadly Choices, but having spent previous time and attention to Wakefield's role, I was satisfied with the amount of attention of Offit gave Wakefield: about five pages. Both Offit and Mnookin's books work well together, covering much of the same ground, but with different emphases. Together they provide a compelling argument that the anti-vaccine movement is one that is not predicated on scientific evidence but on fear and emotion instead. Their perspectives are clear and decisive, and leave no room for doubt. The same can be said about the authors and contributors that comprise Vaccine Epidemic, many of whom are also familiar to readers aware of the autism-vaccine controversy. All three books aim at a wider audience than the autism community; all three books have similar aims: to convince the reader of the rightness of the authors' positions. Mnookin's book is more far-reaching and incorporates other areas of interest where people's fear and panic lead them to believe in things that do not exist, like Morgellons. 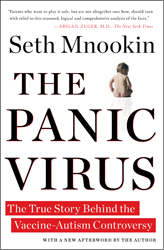 Mnookin's aim is the broadest: to explain how and why people come to believe the things they do, how they allow panic to spread like a virus, and how the internet has allowed this to happen. Offit has suited up to do battle again against a foe that will not disappear. He pushes the emotion buttons where appropriate, and he brings credibility to his perspective by clearly indicating what the dangers of vaccines are, how the CDC responds to those dangers, and what improvement could still be made. He does not ever suggest that vaccines are entirely safe: he is realistic and honest about the risks. Vaccines carry risks; we should continue to work towards more safe and effective vaccines, but those risks do not include autism and they are far less than the risks of the diseases themselves. In contrast to these two works, Vaccine Epidemic is a veritable who's who in the anti-vaccine community: Wakefield, Tenpenny, Boyd Haley of the mining chelator fiasco, and prominent autism-as-vaccine injury bloggers and others contribute chapters to this work. While Offit and Mnookin's books close with the hope that knowledge and reason will ultimately prevail and that the suffering and death caused by infectious diseases will be prevented because reason and knowledge prevail, Vaccine Epidemic ends with a chapter by Wakefield in which he insists that there's been a massive conspiracy to cover up the link between autism and vaccines, and he invokes JB Handley's "big hungry lie" and engages in pitching his book to readers, with a flashy closing that replays in similar fashion but much more grandiosely than Mnookin and Offit: "The day will belong to Reason." All three of these books are packaged similarly. One can even imagine them sitting side-by-side on bookstores' shelves, but two of these book are not like the other. And despite the shared hope that reason will prevail, the authors of Vaccine Epidemic are defining the outcome of reason prevailing entirely differently than Mnookin and Offit are. Is the anti-vaccine movement (or Habakus and Holland's preference of pro-safety terminology despite the openly anti-vaccine sentiments of Sherri Tenpenny) dangerous to society at large? If it remains a marginalized, fringe group, the dangers they pose are buffered by community immunity. Some, like those exposed by the lone Robert Sears' patient, suffer because of the actions one family's decision to engage in risk assessment. If vaccination rates decrease, if community immunity collapses under the weight of people who are swayed by the inflammatory rhetoric of people who make their living off of fear, then we will have a brand new set of questions to answer: where does my right to choose medical interventions end and the public health's needs begin? What right do I have as a parent to decide which vaccines my children receive and when? Until that day arrives, working at combating misinformation is something that we must continue to do. Seeking ever-better and more exhaustive science into vaccine safety and efficacy is something all reasonable people can get behind. Understanding the real risks and the real benefits of vaccination and making truly informed consent is something reasonable people can get behind. Conflating the idea that true informed consent means people wouldn't vaccinate is not, however, and while the rhetoric that Vaccine Epidemic cloaks itself in is an appeal to rugged individualism as patriotically American, it overplays its hand by including individuals who are unashamedly anti-vaccine, misinformed, disgraced, and discredited in its pages. In the end, will most readers take the time to read all three of these works, pick through the notes, work to ascertain where the truth is? Perhaps not. It's a significant investment of time and energy. I think, though, that Mnookin's and Offit's works will be more compelling. But that may be the optimist in me. I was not paid for these reviews. I did, however, receive all three books to review free of charge. I have communicated via email with Dr. Paul Offit over the last two years. He has been kind in answering questions promptly. I have communicated via email with Seth Mnookin and I follow his tweets (I also follow Dr Jay "Nimby" Gordon, so make of that what you will). I have written negatively on Haley, Wakefield, Tenpenny, and Ginger Taylor before. I think, based on the studies to date, that the science does not back up a link between autism and vaccines. I think that vaccines for those who can safely do so are an important tool in the prevention of disease and that we have a moral obligation to protect our children and those who cannot be safely immunized. Yes, I am willing to take one for the team. All royalties from Offit's book go to the Autism Science Foundation. **"In “Medical NIMBYism and Faith-Based Metaphysics”: The total cost of containing the 2008 measles outbreak in California was $176,980, not $10 million. The error was the result of multiplying the total cost of each case by the number of exposed persons (839) and not by the total number of infected persons (11). (p. 272)" correction from www.sethmnookin.com. (thanks for the correction to the commenter who made it whose comment shows partially on my home page, but doesn't show on this page, for some reason).